Thinking Strategically about the Benefits of IPv6 | Techxcellence! In my last blog post on how to sell IPv6 to senior managers and executives, the feedback I got from mailing list discussions was that the case for IPv6 was more of mitigating risk than some inherent benefit of IPv6 itself . That is quite true depending on context. In this article, I will attempt to give more insight into the benefits of deploying IPv6. In a nutshell, viewed from the traditional lens of benefit as something we know and recognise based upon experience, IPv6 has little benefit apart from the large address space. 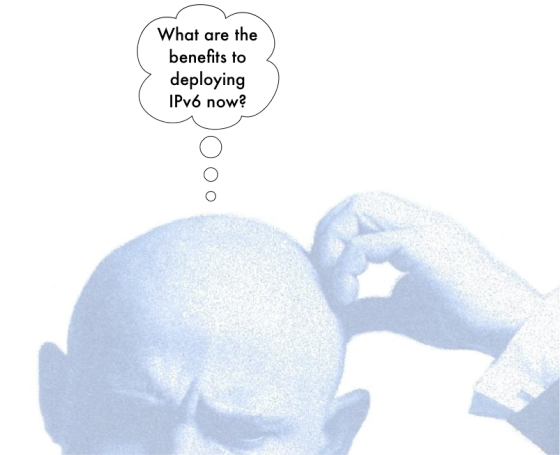 So if that is the only way you can view benefit, then you can stop here, IPv6 has no benefit beyond an increased IP address space, and in the short term, that benefit is definitely outweighed by the costs of staff training, upgrading software and equipment and assuring feature-parity with existing IPv4 solutions. So I’ll admit that in the immediate to short term, apart from mitigating the risks of IPv4 exhaustion, there isn’t a concrete traditional business case for IPv6 for most organisations particularly in IPv4-address rich countries. The realities for IPv4-address poor countries (China, India, most of Africa) can be very different. A more valuable network resulting from more connected network nodes. (Metcalf’s & Reed’s Laws). New and improved services that may result from a larger Internet where the end-to-end model is largely restored and preserved. Improvements in network security resulting from the massive adoption and use of the readily available IPsec protocol in all network hosts as well as the increased visibility that an Internet with much less address translation (ideally none) will afford us. To get an idea of why all the benefits of IPv6 are at this point not knowable, think back to the invention of the TCP/IP suite in 1982, there was literally NO ONE that could have fathomed how valuable it would become just twenty years later. But here we are, doing almost everything from communication, learning and crime to governance, espionage and ‘war’ over the TCP/IP-based Internet. Therefore, despite the ubiquity of today’s Internet, we cannot at this time with hindsight alone confidently project how valuable or not an IPv6-based Internet would be and therefore all attempts to quantify the benefits of IPv6 based upon our experience and knowledge of IPv4 is at best grossly incomplete. The inability to predict the future accurately based on the past is also the reason why traditional Return on Investment (RoI) is not a useful tool in the analysis of the benefits of IPv6. The tools and techniques required to think strategically about IPv6 are not those the corporate world is used to. They cannot depend on data obtained from experience (the past) because one thing we can tell for sure based upon our experience with Internet-driven IT industry is that the experiential data of the past are not always going to be good indicators of future performance or capability. If they were, then back in 2007 for example, the best technology to invest your money in might have been the PC. But as we know the iPhone happened and ushered in the era of mobile computing driven and largely dominated by smartphones and now tablets. And even these might just be waypoints to wearable computing and some other computing paradigms. To conclude, I’d like to borrow from Clayton Christensen’s theories of Disruptive Innovation to explain how IPv6 could become the dominant technology used on the Internet (assuming you don’t believe that IPv4 address exhaustion is enough reason). We can look no further than the evolution of the PC itself and draw parallels. Back in the the period of 1950 – 1970s mainframe computers reigned supreme and the companies that made and sold them were the dominant players in the digital computers market. Then in 1977, the PC appeared on the scene, it too was a computing device, but it in terms of everything that mattered to the currently paying customers of mainframe computers (power, features, capabilities, reliability), the PC was worse largely regarded as being useless. Thus, quite predictably, in accordance with everything that represents good management and thinking, all the mainframe companies chose to ignore the PC (even though they had the technology, resources and marketing organisation to design and market a great PC), all except one of them – IBM. It was also the only mainframe computer company that survived to this day. The rest is living history. Drawing parallels to the above anecdote, the IPv4-based Internet is the dominant technology that provides the features that the majority of today’s Internet users want (or think they want) and are ready to pay for. IPv6 much like the PC in the 70s is the immature, apparently untested contender that might be unattractive to majority of customers today (ever wondered what all those cries of ‘lack of feature parity with IPv4′ really mean?). There are currently a few users (mostly the nerds) that want IPv6 for itself and relatively few device, application and service vendors that want to enable it because they don’t just see the benefit right now. I am willing to bet that like the PC, IPv6 will mature slowly under the radar of the naysayers and in the custody of those vendors whose processes and priorities enable them to select and start IPv6 deployment. It will then be ‘good enough’ or even surpass what IPv4 can possibly offer to the mainstream users. When this happens, users will turn en masse to adopt it, leaving any organisation that failed to deploy IPv6 in a very precarious situation – the same one Digital Corp, Wang, Control Data and the other mainframe computer businesses that failed to adopt the PC found themselves in. b) Those whose resources, processes and priorities/values enable them to prioritise deployment and testing of IPv6 despite its apparent lack of features and maturity compared to IPv4. One of these types of organisation will lead the provision of devices, software and services for tomorrow’s Internet, the other type will lose relevance and then will play catch up. Just remember this: The day you see concrete data to show the benefits of IPv6, it means you are already late to the game, that data will be coming from an early mover who is already making a ‘killing’ with IPv6. So which of those companies would you own? or be working for/with? It is in fact, the mobile arena that will deploy IPv6, we as a small company have already migrated to IPv6 and see huge benefits, your point on Large scale NAT’s does not take into affect that there probably is not enough IPv4 address to build and implement 6to4 or 4to6 Not only should we have switched to IPv6 in the 90’s, but now, by dragging your feet, you are left behind! There are many benefits to IPv6 over IPv4, first being ipsec, and if like us you run a small hosting company and VPN provision, having the extra Blocks of IP’s is a huge bonus, as i have said we are a small company, however we have a total of 288,000,000 ip address to give to our users! If companies leave it to the last min to migrate to IPv6 they will be so far behind the companies that did migrate to IPv6. As Wallace said to Gromit, stop prevaricating about the bush!